About this 720P High Definition Action Camera:The HD action camera comes equipped with a 720p HD lense and a 2" LCD screen to capture the special moment.The action camera is capable of taking both pictures & video with crystal clear resolution.Along with the HD camera you will receive additional accessories, which include a waterproof case, helmet mount, and a handlebar mount.Micro USB charging cable included.SD Card not included.Material: ABS Plastic.Special Instructions:Other imprint methods/areas may be available; please call for details. Please note that product images may not depict the standard imprint method included in pricing. About this Remote Control WiFi Drone with Camera:The Wifi Drone is the most advanced drone currently available.Through the provided App you are able to see live video from your flying drone.Plus you are able to fly the drone from any smartphone.This allows you to take great aerial videos or photos from the HD 720P camera.The flight time is 7 minutes on a single charge.The drone is capable of flying up to 262 ft. from the user.SD card not included.Assembly required.Inventory currently not available.Please contact for ETA.Material: ABS Plastic.Special Instructions:Other imprint methods/areas may be available; please call for details. Please note that product images may not depict the standard imprint method included in pricing. About this Smart Home 1080P HD Home Wifi Camera:Now no matter where you go you can check in on your home, office, or anywhere the Smart Home 1080P HD Home Wifi Camera can be mounted.Once the camera is connected to your wifi network you're able to view the live stream or footage from a certain time from an App anywhere you have mobile service.From the App you can record video, takes photos, use the camera as a microphone.The camera can rotate 355 degrees horizontally and 110 degree vertically.The Built in motion sensors will trigger the camera to follow the motion automatically.You can also control the view of the camera from the App.Compatible with any micro SD card up to 64GB.AC Adapter, Micro USB Cable, and wall mounts are included.The camera is only able to connect to 2.4Gz networks.Compatible with Amazon Alexa or Google Home.Micro SD Card not included.Material: ABS Plastic. About this 360 Wifi Action Camera:The 360 WifFi Action Camera comes equipped with a 1080P HD lense and a 0.96" LCD screen to take your photography to the next level. Through an App you can stream live video from your connected device with the 360 camera. The 360 Camera is capable of taking both pictures & video with crystal clear resolution in full 360 panoramic view. The footage can be transferred wirelessly to your email, cloud storage, or social media account. Along with the HD camera you will receive additional accessories, which include a waterproof case, helmet mount, and a handlebar mount. The case is waterproof up to 30 meters. Micro USB charging cable included. SD Card not included. A 32 GB SD card is recommended.Material: ABS Plastic.Special Instructions:Other imprint methods/areas may be available; please call for details. Please note that product images may not depict the standard imprint method included in pricing. About this HD 720P Home Wifi Camera:Now no matter where you go you can watch live feed with the 720P Home Wifi Camera. Simply connect the camera to your wifi network. Once connected you can stream live video from the recommend App. From the App you can record video, takes photos, or use the camera as a mic. Compatible with any micro SD card up to 64GB. AC Adapter and wall mount included.Micro SD Card not included.The camera is only able to connect to 2.4Gz networks. Material: ABS Plastic.Special Instructions:Other imprint methods/areas may be available; please call for details. Please note that product images may not depict the standard imprint method included in pricing. About this 4k Wifi Action Camera:The HD Wifi action camera comes equipped with a 4k HD lens and a 2" LCD screen to capture the special moment.The action camera is capable of taking both pictures & video with crystal clear resolution.The wifi capabilities allow you to take your photography to a new level.Simply download the suggested App to control the camera from your mobile device.Along with the HD camera you will receive 13 additional accessories, which include a waterproof case, helmet mount, and a handlebar mount.Micro USB charging cable included.Micro SD Card not included.Material: ABS Plastic.Special Instructions:Other imprint methods/areas may be available; please call for details. Please note that product images may not depict the standard imprint method included in pricing. About this Smart WiFi Security Camera:View images from anywhere in the world.Phone monitoring available with Apple and Android devices.Wireless control over camera's settings via mobile devices.360 degree rotation.Record settings can be set to "Auto Record" for 24 hour recording, footage stored on SD card. Note that when SD memory run outs (up to 64 GB supported) older footage will be overridden.Record feature on App will record footage within the App itself, not to the SD card.Alarm settings will record video footage when sensing movement for up to two minute after initial movement, which will be stored on the SD card.Supports 64 GB SD card (not included).Two-way audio with built in microphone and speaker.Night vision distance up to 10 meters.Supported by free mobile app V380.720P (1280x720) resolution.USB cable included.No battery - must be plugged in at all times.Great for home security or child monitoring. About this Smart WiFi Security Camera, Full Color Digital:View images from anywhere in the world.Phone monitoring available with Apple and Android devices.Wireless control over camera's settings via mobile devices.360 degree rotation.Record settings can be set to "Auto Record" for 24 hour recording, footage stored on SD card. Note that when SD memory run outs (up to 64 GB supported) older footage will be overridden.Record feature on App will record footage within the App itself, not to the SD card.Alarm settings will record video footage when sensing movement for up to two minute after initial movement, which will be stored on the SD card.Supports 64 GB SD card (not included).Two-way audio with built in microphone and speaker.Night vision distance up to 10 meters.Supported by free mobile app V380.720P (1280x720) resolution.USB cable included.No battery - must be plugged in at all times.Great for home security or child monitoring. The 720P High Definition Action Camera is a great promotional item to have at your events. Almost like a GoPro, customers will want to have it! Record all your memories with this fun item. At an affordable price, you can save all your favorites moments with this promotional item. Promote your logo on a high tech item that many customers will be dying to own! Don’t miss out on this fun marketing tool. The HD action camera comes equipped with a 720p HD lense and a 2" LCD screen to capture the special moment. The action camera is capable of taking both pictures & video with crystal clear resolution. Along with the HD camera you will receive additional accessories, which include a waterproof case, helmet mount, and a handlebar mount. Need a fun and cool item as an employee incentive? 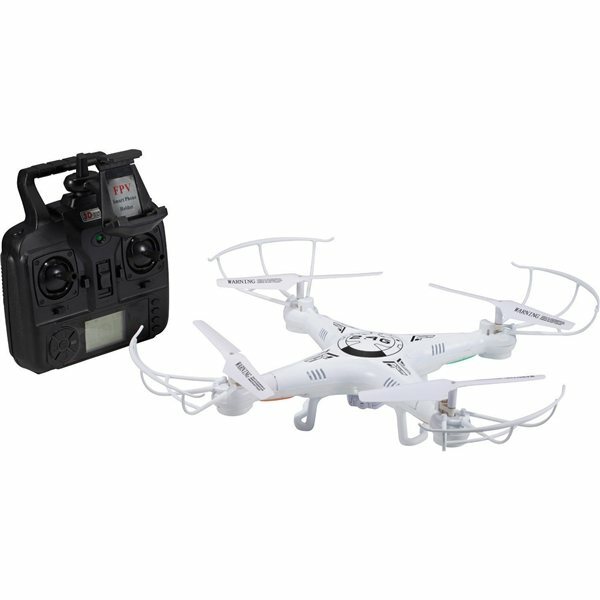 The Remote Control WiFi Drone with Camera is the perfect promotional item to give to your employees! Reward your customers or employees with a drone. Drones are currently trending in popularity, so you know this is the perfect item! The Wifi Drone is the most advanced drone currently available. Through the provided App you are able to see live video from your flying drone. Plus you are able to fly the drone from any smartphone. This allows you to take great aerial videos or photos from the HD 720P camera. The flight time is 7 minutes on a single charge. The drone is capable of flying up to 262 ft. from the user. Order your Remote Control WiFi Drone with Camera here. Want your junior police academy cadets to feel like professionals? Give them our HD 720P Camera Sunglasses to wear. They’ll feel like investigators all the time! Keep your hands free with our camera sunglasses. You’ll be able to do everything normal with your sunglasses on. The sunglasses feature a High definition 720P camera in the center of the sunglasses. This gives you the perfect angle to capture any moment. The sunglasses are compatible with any microSD card up to 64GB. In our selection of camera and video, you’ll be able to see all the fun products customers love to have. We have high definition action cameras, camera sunglasses, remote control wifi drones with cameras, home wifi cameras, and more. Camera and videos are great to record memories with. Why not give something that your customers will keep for a long time? Camera and video products will allow your customers to cherish their memories for every event. Promotional camera and video are perfect for all events! If you want your customers to remember your event, give them a promotional camera or video. Look through our selection of camera and video. Shop here! AnyPromo always aims to help make an impact on your brand while getting the best bang for your buck! Search our camera and video inventory to find what best fits your promotional needs. Camera and videos are perfect for any trade shows that are meant to be memorable. Give your customers the ultimate tech item that will make everyone running to your booth for one. Camera and videos are great to help keep memories! We have different styles of cameras and videos available in our selection. Select the best fit for your company. Below you’ll find a list of some of our trending promotional camera and video. Every item is available and waiting for you to order. Promotional camera and video make events much more fun. Whether you're exhibiting at a concert or trade show, customers love to record their memories! Want to make your customers smile big? Camera and video is definitely it! Today, technology is huge with customers, and giving them the tech they need will only make them happier. Our featured list of camera and video are popular in this category. You won’t want to miss out on checking these options!